Exzellenzes product design, professional tuning system, high-density three-layer noise reduction, intelligent mixed-chip professional audio processor, high-quality chipset with 2 channels of stereo audio conversation, awesome live karaoke sound , rhythm of light music with echo reverberation. Bluetooth or cable connection. Established a high quality Bluetooth module that can be used as a speaker, player and recorder. You can connect the phone directly to the 3.5mm jack or connect to Bluetooth and get a clear sound effect, animation effect. You can sing anywhere, anytime. Fantastic singing at karaoke, family singing, singing trips, interviews and live broadcasts. Applies to almost all devices, tablets, PCs, laptops and most iOS and Android music applications. The micro SD card slot supports up to 64 GB (not included) micro-SD card to play songs, Bluetooth up to 10 meters, compatible with Android, iPhone, iPad, iOS and smartphone. Multiple function keys to change echo, volume, music PA / R. Einstellen Previous and next song mode. The adjustable length echo offers incredible and engaging happiness. Charging is via the mini USB cable. Gifts - this is a surprise birthday gift for children and adults, it is also a great gift for Christmas, parties and celebrations. It can also improve the party atmosphere. It is a magical Karaoke microphone that turns the tradition upside down. It gets rid of so many cables everywhere. You can enjoy karaoketime every time. 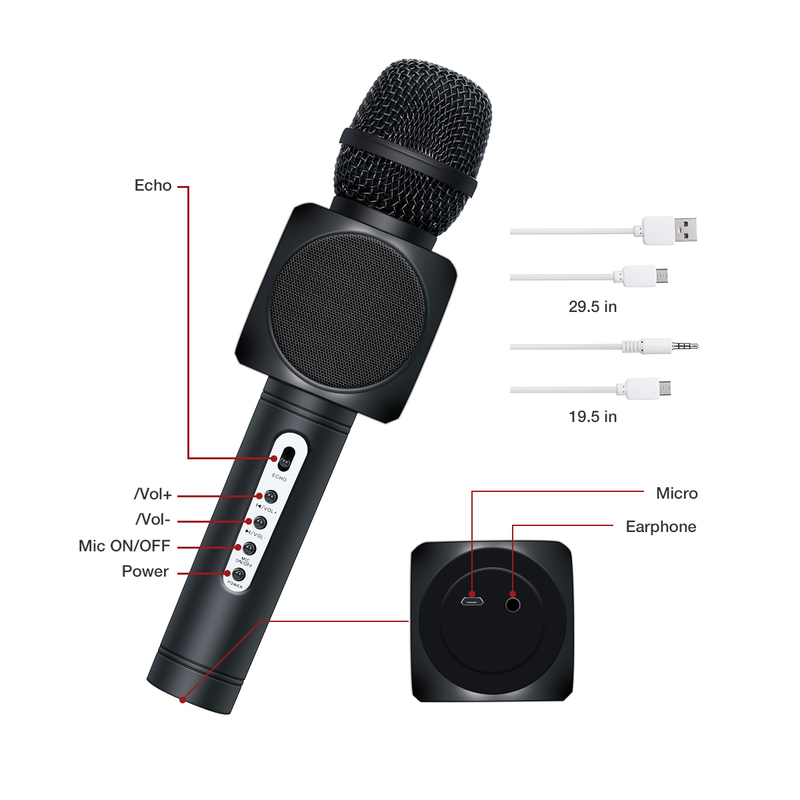 Ligtweight microphone.IOS and Android compatible systems, or connect it with other devices via a 3.5mm cable.Nasum microphone also supports USB flash drives and is very easy to use.With the professional tuning button and advanced integrated sound processor, you can enjoy the sound effect. When playing U disk songs, you can control the volume of the voice by printing the "+" "-" key for 3 seconds. The "Eco" button for 3 seconds was to adjust the volume of the music. the power button for 3 seconds to turn on or off the microphone, the light would show the. Bluetooth connection: turn on your Bluetooth phone / tablet, Search Bluetooth device, choose and connect to "H6", it would be matched. Adjust the voice and Echo mode. Topping point: About 3-4 hours. Working time: About 13-15 hours. Product size: 10.2 x 3 x 3inches.